How many times have you been told that breakfast is the most important meal of the day? You have probably been told over and over again not to skip breakfast as it will give you a head start to your day, keep you focused, give you energy and perhaps also provide a plethora of other health benefits. However, there are still about 12% of adult women and 16% of men who are skipping this critical meal. One of the most common reasons people often skip breakfast is due to a lack of time. Often you feel rushed in the morning and barely have time to get ready. Eating something quick and easy like a bowl of cereal may have many health benefits though. Studies have shown that people who regularly consume breakfast cereals are more likely to be consuming lower levels of fat and cholesterol compared to those who rarely or never consume breakfast cereal. By eating breakfast cereal you are more likely to meet your daily vitamin and mineral nutrient requirements, such as B vitamins, vitamins A and D, iron, magnesium, zinc, and calcium, and have an overall improved nutritional status. Eating breakfast cereal on a daily basis also means you are more likely to have a higher intake of carbohydrates and total sugars. On the other hand, your intake of total daily calories, protein, and sodium does not differ regardless of whether you regularly consume cereal or not. Several studies have indicated that people who regularly consume breakfast cereals compared to non-consumers or occasional consumers were more likely to have lower BMIs and were less likely to be overweight. 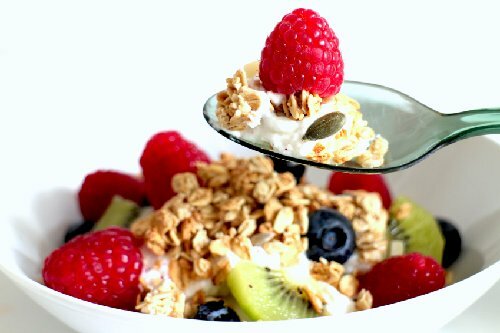 Furthermore, some studies found that replacing a meal or a snack with breakfast cereal helped with weight loss. If you consume breakfast cereals, especially ones that are high in fiber, you are more likely to feel full and satisfied. This likely prevents you from snacking on convenient and unhealthy options later on in the day and thus, overindulging in excessive calories. However, several studies have shown no protective effect against weight gain and overall weight status. Because there are many conflicting study results, further long-term intervention trials are warranted. Incorporating breakfast cereals that are rich in whole grains and high in fiber can help manage or prevent the development of diabetes. High fiber food choices have been known to help manage blood sugar levels due to their decreased absorption rate and slower release of sugar into the bloodstream. A recent meta-analysis evaluated the effects of consuming whole grains versus sugary cereals and the risk of developing type 2 diabetes. Findings revealed that consuming whole grain cereals resulted in a 30% reduced risk of developing type 2 diabetes. There were no associations found between consuming sugary cereals and diabetes risk. Among those with diabetes, consuming muesli or cereals that were oat, barley, or psyllium-based showed improved glucose or insulin level responses. Healthy individuals also demonstrated improved glucose responses when consuming high fiber cereals. However, there have been few long-term studies demonstrating these beneficial effects of high fiber cereals; therefore, stronger evidence is warranted. Incorporating foods high in fiber are known to reduce your total and bad cholesterol levels, which are both risk factors associated with heart disease. Fibrous foods can trap fatty foods and cholesterol-containing compounds in your intestine, preventing them from being absorbed and therefore eliminating them altogether. While no studies were found that demonstrated the benefits that breakfast cereals may have on reducing cholesterol levels and reducing risk of heart disease, there were some studies that demonstrated beneficial effects of high-fiber cereals. Findings from these studies revealed that consuming at least three servings of whole grain cereals containing oats, barley, or psyllium, not only reduced total and bad cholesterol levels, but reduced risk of heart disease by 20% – 30%. While having a balanced breakfast is the most ideal way to start your day, incorporating a quick bite of breakfast cereal before heading off to work can do wonders. It will give you energy and improve your cognitive performance throughout the day. More so, consuming breakfast cereals can also help you meet your nutrient requirements, reduce your late afternoon and evening binges, help manage your weight, protect against diabetes and also reduce your risk of heart disease. Make breakfast cereal a part of your daily routine. You can incorporate it into a healthy, balanced breakfast by adding a protein source such as milk or Greek yogurt, and top your cereal with some berries. Williams, P. G., “The benefits of breakfast cereal consumption: A systematic review of the evidence base,” Advances in Nutrition, 2014; 5: 636S-673S.